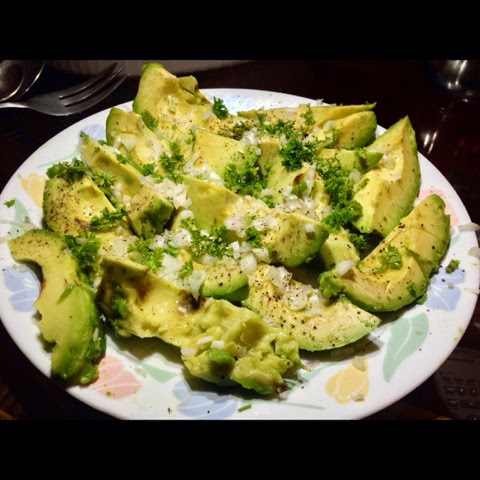 Avocadoes are probably one of the very few things we can describe as rich, creamy, delicious, .... and oh so good for you! I mean really, how often do all those words meet at one place?? Though high in fat its good fats - monounsaturated fats that actually increase good cholesterol (yes there is such a thing) to help reduce bad cholesterol. Maintains the right blood pressure, fights heart disease, and migraines! I think the biggest problem for us is getting good avocados in the city. And furthermore, picking them just right. To be honest there isn't a sure shot formula - you just have to keep at it till you become the ultimate avocado picker - it really is all about the feel. Colour - The varieties I have noticed here tend to turn to a very dark purpley-black colour . Some have crinkly skin that is just fine. However, several varieties stay green at ripeness. Which bring us to our next point. Feel - Most important. Hold the avocado in your palm so you can apply pressure evenly without ruining it for the next person. Press gently, with your palm rather than poking with your fingers in other words. If it feels firm - it is underripe - but if you need to eat it in a day or two then wrap it in a newspaper and leave it out. Leaving it next to ripe bananas speeds up any fruits' ripening process but I personally feel the smell of the banana can transfer on, which is no good. Similarly, if the avocado feels too soft it will be overripe and mushy. If the avocado is bruised or dented - avoid, you are walking in to an overripe avocado trap. Shake it - If the seed sounds too loose it may be overripe. But a bit offset from the fruit is good. Another tip is to lightly peel of the remaining stem. If it is brown, underneath you have a mushy avocado. Yellowy green underneath - ripe. However, I don't really encourage this method because you can't really pluck things apart and leave them for others to buy later. Exposing air to the fruit will be a guaranteed rotten-leftover for others. Run a knife vertically across the fruit - top to bottom - but all the way around till the two cut points meet . Gently separate the two halves. Easiest to take a biggish spoon and scoop out the fruit. Avocados are such versatile fruits. Eat them savoury in a salad, sandwich, sushi or on their own - or add them to milkshakes and ice-creams! I love eating mine (picture above) with just a generous sprinkling of salt and lime (absorbs a lot) - in this case I also had the whites of spring onions and parsley which I chopped and put. Drizzle of extra virgin olive oil. Oh and a pinch of black pepper! You can of course make delicious Guacamole - If you have a mortar and pestle - put diced White Onions (red will do), bit of Green Chilli (if you can get your hands on Jalapenos even better), finely chopped cilantro, Salt (important - what will help create abrasion to help you grind those ingredients) - once a course paste is made - leave a few bits and bobs - scoop out the avocado in to the mortar. Grind it up as to your preference - some like it smooth, some like it chunky. Top it with a splash of lime - Mix up and enjoy!! I personally prefer my guac without tomatoes but if you don't - add them finely diced at this point. Some more great avocado recipes here: http://www.buzzfeed.com/tashweenali/super-easy-avocado-recipes . Don't miss the baked eggs in avocado!